A show of 2 halves! This year celebrates 50 years since Elvis Presley's televised NBC Special, which came to be known as the '68 Comeback Special. It was pivotal to the success of Presley's career at that time and despite Elvis's doubts about his popularity - what with the so called British invasion of the Beatles in full force and his movie career taking a nosedive, added to which he hadn't performed a live concert for seven years - it goes without saying that the Special successfully reignited the career of America's greatest chart star. How fortuitous then, that This Is Elvis, a brand new musical from the Bill Kenwright stable, should pop up just in time for UK audiences to celebrate this iconic anniversary. It begins with a hesitant Presley performing in front of a live audience at the NBC Studios, nervous that his career has gone down the pan and that he won't be able to deliver but gaining confidence as he rocks and grinds that famous pelvis through numbers such as Trouble, Heartbreak Hotel, Hound Dog, All Shook Up and Love Me Tender. He wows the audience enough for his manager, Colonel Parker to set him up for a Vegas gig which will reap huge financial rewards but deep down all Elvis really wants is to play smaller venues across the country with his band but is torn by his loyalty to his money hungry manager. Presley's lack of belief in himself, with his constant anxieties over his popularity and his music is always to the fore and and Steve Michaels who plays Elvis makes a fine effort in bringing this vulnerability to the surface throughout his performance. Michaels is an international award-winning Elvis tribute artist and absolutely nails every characteristic, look and mannerism of the King of Rock and Roll, even down to the way he nervously plays with his hands and wipes the sweat from his brow. Having to work his way through this rather weak script though is a rather unfair challenge but one, I am sure, that those who are in the audience to reminisce probably won't give a hoot about. Act 1 takes us on the 12 month journey from the '68 Special through to Elvis's performance at the International Hotel in Las Vegas and introduces us to the friends and band members who tried to help Elvis through his problematic life. Reuven Gershon and Mark Pearce stand out as Joe Esposito and Charlie Hodge with some great characterisations and musicianship. 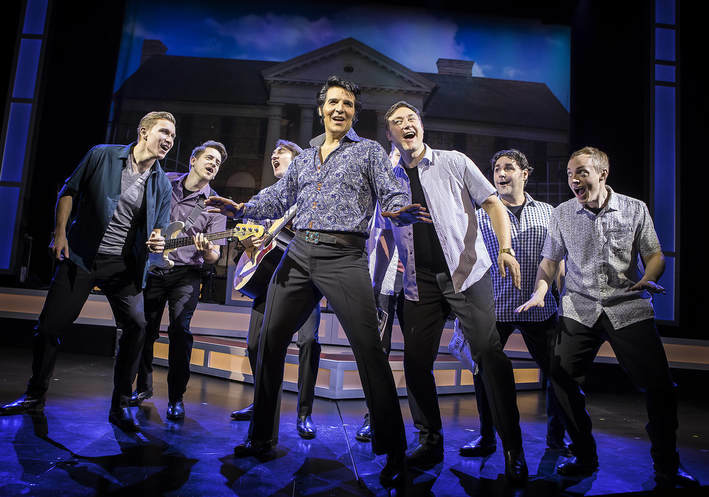 In fact all of the supporting ensemble prove to be outstanding musicians and the show really comes alive when they are all in full force as Elvis's backing band. This is definitely a show of two halves and it's only when you get to see and hear the full-on effect of Steve Michaels performing as Elvis in Act 2's Vegas Showroom gig set up, that you realise just how spookily similar he is to Presley and also just how polished a performer he is. Watching Michaels you can just imagine what it would have been like to see the real Elvis in all his hip thrusting glory. By the time Michaels and the band had worked their way through the 20 odd songs, including Viva Las Vegas, Blue Suede Shoes, In The Ghetto, An America Trilogy and Jailhouse Rock, the audience are up on their feet with some even jitter-bugging in the aisles. This is Elvis may not have the depth that other musicals based on real life musicians has (Beautiful for instance) but it will give you a brief insight into the mind of Elvis during that time and it is worth it to watch the jaw dropping moves and vocals of Mr Steve Michaels. Although, inevitable, it's still disappointing when the announcement is made that "Elvis had left the building"! Southend's Cliff Pavilion is the last leg of the tour for the production, with the anniversary of Elvis's death on 16th August falling slap bang in the middle of it giving the show extra poignancy. If you're a fan of Elvis and his music and want to get a chance to really feel what it would have been like to be at one of his concerts 50 years ago, get down to the Cliffs Pavilion - you won't get a better opportunity!